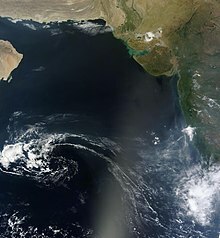 The Arabian Sea's surface area is about 3,862,000 km2 (1,491,130 sq mi). The maximum width of the Sea is approximately 2,400 km (1,490 mi), and its maximum depth is 4,652 metres (15,262 ft). The biggest river flowing into the Sea is the Indus River. 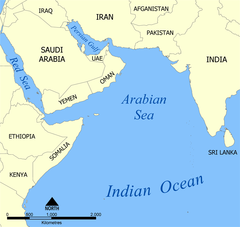 The Arabian Sea has two important branches — the Gulf of Aden in the southwest, connecting with the Red Sea through the strait of Bab-el-Mandeb; and the Gulf of Oman to the northwest, connecting with the Persian Gulf. There are also the gulfs of Khambhat and Kutch on the Indian Coast. The countries with coastlines on the Arabian Sea are Somalia, Yemen, Oman, Pakistan, India and the Maldives. There are several large cities on the sea's coast including Male, Kavaratti, Cape Comorin (Kanyakumari), Colachel, Kovalam, Thiruvananthapuram, Kollam, Alappuzha, Kochi, Kozhikode, Kannur, Kasaragod, Mangalore, Bhatkal, Karwar, Vasco, Panjim, Malvan, Ratnagiri, Alibag, Mumbai, Daman, Valsad, Surat, Bharuch, Khambhat, Bhavnagar, Diu, Somnath, Mangrol, Porbandar, Dwarka, Okha, Jamnagar, Kandla, Gandhidham, Mundra, Koteshwar, Keti Bandar, Karachi, Ormara, Pasni, Gwadar, Chabahar, Muscat, Duqm, Salalah, Al Ghaydah, Aden, Bargal, and Hafun. On the west: the eastern limit of the Gulf of Aden [the meridian of Cape Guardafui (Ras Asir, 51°16'E)]. On the north: a line joining Ràs al Hadd, east point of the Arabian Peninsula (22°32'N) and Ràs Jiyùni (61°43'E) on the coast of Pakistan. On the south: a line running from the southern extremity of Addu Atoll in the Maldives, to the eastern extremity of Ràs Hafun (the easternmost point of Africa, 10°26'N). On the east: the western limit of the Laccadive Sea a line running from Sadashivgad on the west coast of India (14°48′N 74°07′E﻿ / ﻿14.800°N 74.117°E﻿ / 14.800; 74.117) to Cora Divh (13°42′N 72°10′E﻿ / ﻿13.700°N 72.167°E﻿ / 13.700; 72.167) and thence down the west side of the Laccadive and Maldive archipelagos to the most southerly point of Addu Atoll in the Maldives. 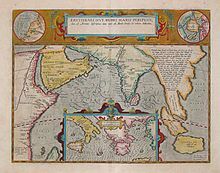 The Arabian Sea historically and geographically has been referred to by many different names by Arabian and European geographers and travellers, including Indian Sea, Persian Sea, Sindhu Sagar, Arabbi Samudra, Erythraean Sea, Sindh Sea, and Akhzar Sea. 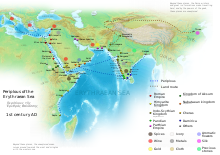 The Arabian Sea has been an important marine trade route since the era of the coastal sailing vessels from possibly as early as the 3rd millennium BCE, certainly the late 2nd millennium BCE through the later days known as the Age of Sail. By the time of Julius Caesar, several well-established combined land-sea trade routes depended upon water transport through the Sea around the rough inland terrain features to its north. These routes usually began in the Far East or down river from Madhya Pradesh with transshipment via historic Bharuch (Bharakuccha), traversed past the inhospitable coast of today's Iran then split around Hadhramaut into two streams north into the Gulf of Aden and thence into the Levant, or south into Alexandria via Red Sea ports such as Axum. Each major route involved transhipping to pack animal caravan, travel through desert country and risk of bandits and extortionate tolls by local potentates. The Kochi Port located on the south-west coast of India is the nearest Indian port to the international shipping routes, as well as one of the largest and busiest ports serving the Arabian Sea. Seen here is the International Container Transshipment Terminal, the only such facility in India. The Port of Karachi is Pakistan's largest and busiest seaport. It is located between the Karachi towns of Kiamari and Saddar. The Gwadar Port is a warm-water, deep-sea port situated at Gwadar in Balochistan, Pakistan at the apex of the Arabian Sea and at the entrance of the Persian Gulf, about 460 km west of Karachi and approximately 75 km (47 mi) east of Pakistan's border with Iran. The port is located on the eastern bay of a natural hammerhead-shaped peninsula jutting out into the Arabian Sea from the coastline. Port of Salalah in Salalah, Oman is also a major port in the area. The International Task Force often uses the port as a base. There is a significant number of warships of all nations coming in and out of the port, which makes it a very safe bubble. The port handled just under 3.5m teu (twenty-foot equivalent unit, a measure used for capacity in container transportation) in 2009. Jawaharlal Nehru Port in Mumbai is the largest port in the Arabian Sea, and the largest container port in India. Major Indian ports in the Arabian Sea are Mundra Port, Kandla Port, Nava Sheva, Kochi Port, Mumbai Port, and Mormugão. 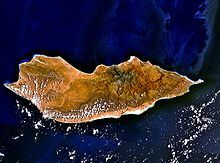 There are several islands in the Arabian Sea, with the most important ones being Lakshadweep Islands (India), Socotra (Yemen), Masirah (Oman) and, Astola Island (Pakistan). The Lakshadweep Islands (formerly known as the Laccadive, Minicoy, and Aminidivi Islands) is a group of islands in the Laccadive Sea region of Arabian Sea, 200 to 440 km (120 to 270 mi) off the south western coast of India. The archipelago is a Union Territory and is governed by the Union Government of India. The islands form the smallest Union Territory of India: their total surface area is just 32 km2 (12 sq mi). The lagoon area covers about 4,200 km2 (1,600 sq mi), the territorial waters area 20,000 km2 (7,700 sq mi) and the exclusive economic zone area 400,000 km2 (150,000 sq mi).The islands are the northernmost of the Lakshadweep-Maldives-Chagos group of islands. Astola Island, also known as Jezira Haft Talar in Balochi, or 'Island of the Seven Hills', is a small, uninhabited island in the northern tip of the Arabian Sea in Pakistan's territorial waters. Landsat view over Socotra, a Yemeni island. The dead zone is an area in the Gulf of Oman that is completely depleted of oxygen, as a result of which it does not support marine life. It is the world's largest-known dead zone with an area larger than that of Scotland. ^ Banse, Karl, and Charles R. McClain. "Winter blooms of phytoplankton in the Arabian Sea as observed by the Coastal Zone Color Scanner." Marine Ecology Progress Series (1986): 201-211. ^ Pham, J. Peter. "Putting Somali piracy in context." Journal of Contemporary African Studies 28.3 (2010): 325-341. ^ a b "The Voyage around the Erythraean Sea". washington.edu. ^ a b "Kamat's Potpourri: The Arabian Sea". kamat.com. ^ "TRAFFIC HANDLED AT MAJOR PORTS (LAST 7 YEARS)" (PDF). shipping.gov.in. ^ "WORLD PORT RANKINGS" (PDF). aapa.files.cms-plus.com. 2009. ^ "World's largest 'dead zone' discovered, and it's not in the Gulf of Mexico". nola.com. This article incorporates text from a publication now in the public domain: Chisholm, Hugh, ed. (1911). "Arabian Sea" . Encyclopædia Britannica (11th ed.). Cambridge University Press.